The Wood Turtle was listed as a threatened species in 1975. Wood Turtles are semi-terrestrial animals (live on land and in water) that are primarily associated with moderate to fast flowing rivers and streams that have either a sand, gravel or coble substrate. Their range encompasses all the northern counties in Wisconsin and the southern edge of their range roughly follows a wavering line from Green Bay to Prairie du Chien. The decline in their population is more noticeable in the southern counties where agriculture and other land uses have degraded water quality in the rivers they occupy or once occupied. They strongly prefer clear (non-turbid) but tannin stained water. This turtle is associated with warm, cool and cold water streams. Their terrestrial habitats include lowland hardwood forests, riparian shrub communities (e.g. alder thickets and willow brush) and open meadows, although they will frequently use upland deciduous and coniferous forests to forage during the summer months. Open canopy (sunny) habitats close to the water are favored by females that are gestating eggs. Wood Turtles prefer to nest in sandy soils where vegetation is sparse or non-existent. In the northern half of their range, especially above Highway 8, most of the riverine habitats are surrounded by forests. Until very recently, there has been almost no work done to address the conservation and recovery of this turtle. As a result, many of the nesting areas that were once available have become overgrown by brush and tree growth. While it is not known how many of these nesting sites were created by human disturbances, the fact remains that they have become far too scarce. This has resulted in Wood Turtles becoming much more dependent on nesting at bridge crossings, where road corridors afford a narrow but often semi-suitable area of open sunny habitat where females can deposit their eggs, usually in road shoulders. A major consequence of relying on bridge crossings for nesting is significant adult female road mortality. The same can be said about roads that parallel streams that are close to the water (usually within several hundred feet). Sunny roadsides are magnets for turtle nesting and the results can be disastrous from a population perspective, especially for species like the Wood Turtle. Wood Turtle take 12-15+ years to reach maturity and species that are slow to mature and that are long lived (have the potential to lay eggs for decades) cannot withstand high adult mortality, especially of reproductive females. 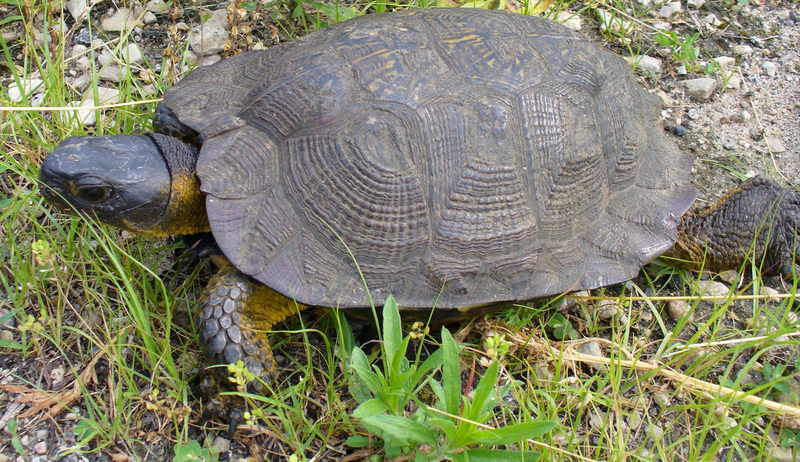 Population experts believe that slow to mature, long-lived species can only sustain perhaps 1-3% annual adult mortality, including natural mortality, and many Wood Turtle populations have been experiencing unsustainable road mortality for decades. Wood Turtles have also suffered at the hands of humans in another way. For many years these turtles were collected in large numbers by the biological supply trade, providing animals for biology classrooms and research around the world. A now defunct business in Oshkosh reported that they once collected hundreds of Wood Turtles every year, for many years, from Wisconsin’s rivers to supply the research community. As the biological supply trade began to shift away from the use of live animals in the 1970’s, another worldwide trade has emerged, the massive pet industry, and many biological supply houses shifted their trade to supply a variety of wild-caught animals, including Wood Turtles, to the pet industry. Collecting of Wood Turtles was stopped when it was listed as a threatened species in 1975. However, with today’s online trading, there are people still involved with illegal collecting of this turtle and the market is much more difficult to monitor and control. As mentioned in the Threats to Wisconsin’s Rare Turtles Section above, nest predation from a booming medium-sized mammal population is especially raising havoc with Wood Turtle populations. Wood Turtles are often forced to “cluster nest” due to the lack of nesting sites. Nest predators are consuming an estimated 85 – 100% of these nests year after year. Michigan’s premier Wood Turtle expert, Dr. James Harding, reported that he has not seen a juvenile wood turtle in 15 years in several populations that he monitors annually. He believes that the Wood Turtle populations he monitors are experiencing 100% nest predation each year. Nest predation is likely amplified by the fact that so many Wood Turtles nest along roads, making nest detection by predators especially easy since they can simply walk along road shoulders to locate nests. You can also help by providing Turtles For Tomorrow with your observations of rare turtles and nesting sites. See the Highlights Section of this website for more detail on our annual accomplishments.